Pour just enough olive oil to cover the bottom of the bottom of a non-stick pan and heat over medium heat. Once heated, add banana slices and cook 1-2 minute on either side until golden brown. While this is happening mix Honey with liquid of choice and set aside. Remove from heat and drizzle honey mixture over top. When sizzling subsides, sprinkle with a little cinnamon and serve with ice cream or French toast. Sometimes on cold wintry days a plain banana doesn’t quite cut it – but you really want that banana flavor to top some French toast or ice cream. Enter Honey Fried Bananas! 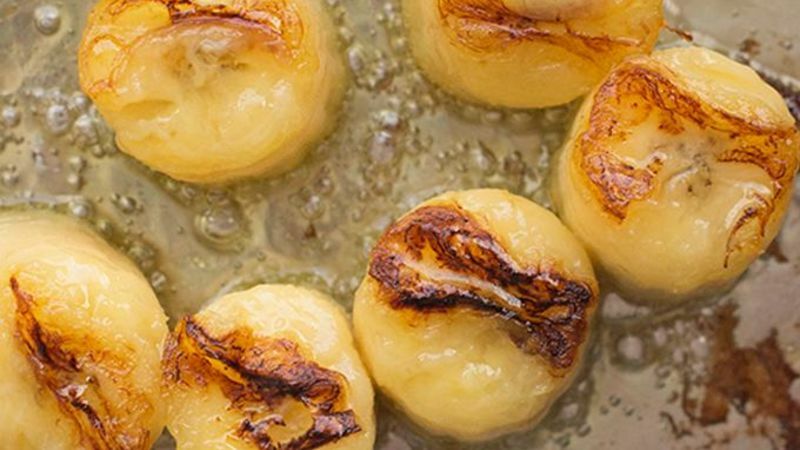 We don’t actually deep fry these bad boys, but instead pan fry them in just a little bit of olive oil, then top them with a little honey to give them a crispy outside and a soft, creamy inside. The ingredients don’t get much simpler than this! A banana, some honey, a liiiittle olive oil and some cinnamon. Step one is cutting up the banana. I like 1-inch slices because it leaves a little extra room for cooking time and there's less risk of a mushy pan of bananas. Then heat up just enough olive oil to cover the bottom of the pan on medium heat and add the bananas to brown on either side. While that happens, mix the honey with just a little bit of water (or rum). Remove the pan from the heat and add the honey mixture to add a little extra sweetness. Once the bubbling subsides, sprinkle over the cinnamon. If you want a nice even browning, your best bet is a non-stick pan. Now eat! Any way you want, but my top vote goes to French toast or ice cream or even blended into a milkshake. Maybe drizzle with chocolate sauce or a sprinkle of powdered sugar?